I deliberately do social media to encourage, add value and inspire people to be all God has called them to be. I do this because my main purpose in life is to add value to others and encourage them to be their best in all God has called them to do plus be. Every day, I thank God that I can be a blessing to as many that I meet with my smile, my words and every resource God has given me to help others with. Why am I blabbing about why I am on Socia media? A few minutes ago, I got a bb message from one of my contacts , saying a young man parked his car this morning and jumped into the lagoon or river on third mainland bridge. This news was so painful to me that my countenance changed, i was sad plus vexed in my spirit at the same time! I may not know the person but in my head, that is someone's son, brother, friend, colleague or even someone's husband or father. What will make a man take the path of suicide? Is he mentally ill? Is it a spiritual thing as we will say here in Nigeria? Is he on drugs? But whatever drove him to taking his own life, only God knows. My concern now is for those that are still alive...please let's get help, if we are feeling down, depressed and overwhelmed, get help, reach out to someone please I beg you. Those of us here, be kind enough to look beyond your home and reach out to others, people are hurting, in their homes, offices, they need someone to listen to them. Look beyond your clothes, make up..help others, give a smile, say hello, be kind to ask after others, it's not always about money..please let's all do something to reduce this demon of suicide that is on the increase. If you are reading this message and you are feeling overwhelmed by things around you...kindly take a deep breath, inhale and exhale, then say this short prayer...God, I need your help and I need you now, come into my life, come and be The Lord of my life, Jesus Christ, help me to let go of the pains, hurts, bitterness , unforgiveness in my heart and help me to receive the comfort only you can bring, change my situation for good in Jesus name amen. 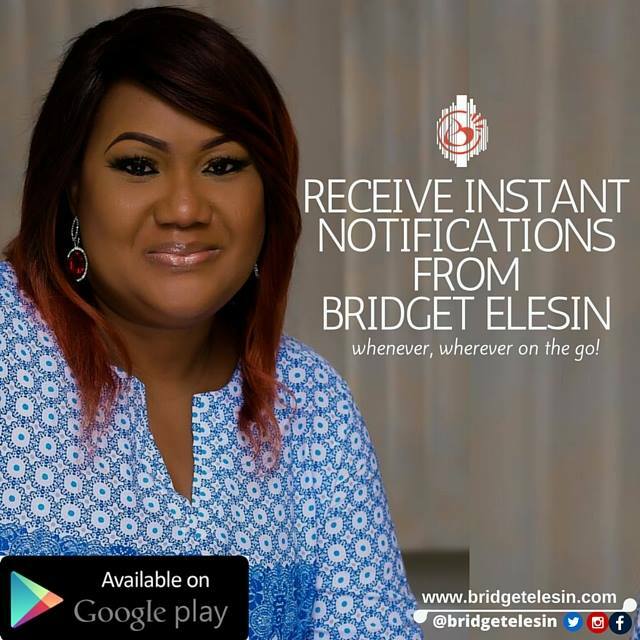 Please don't just stop at this prayers, look for someone to talk to that can help or send me a message on face book or on twitter @BridgetElesin or to my friend, the celebrity shrink @drmaymunah , so we can help in any way. Just by listening to some people, you can save them. Today, deliberately ask God to help you bring comfort to someone. May God help us all.